We aim to live plastic-free in our household, but upon inspection, you will find the ubiquitous plastic containers, although BPA-free. Utensils and dinnerware designed for children are often made of plastic, as parents fear breakables and expense, but it doesn’t have to be so. Life Without Plastic is a great online retailer that can help you find safe alternatives for your family. Our vision is to help all living beings, including the Earth, by working toward decreased reliance on plastic. We realize that plastic is not going to disappear any time soon. We recognize the benefits of plastic and the important roles it plays in society. We simply wish to build awareness about its dangers and the existence of healthier alternatives for household products. Healthier for the Earth, healthier for us all. 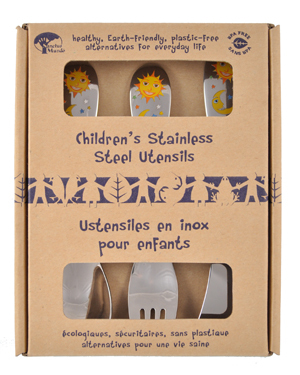 Life Without Plastic sent us a Children’s Stainless Steel Utensils – Sun Moon Stars Cutlery Set. These cute utensils have wider handles that are easier for little hands to grip, and the whimsical designs are sure to delight. Put the universe in your little one’s hands! Our brand new, and long-awaited, Children’s Stainless Steel Utensils are delightfully adorned with a smiling moon and sun reclining in a sea of stars. The fork’s blunt tines and the knife’s gently rounded edge are safe for small mouths, and the spoon is generously deep to hold the ideal gulp of cereal, yogurt and everything in between. They are the perfect size for small hands, yet large enough to grow with your child. Our eight year-old loves to use them. I really like these utensils! They are made in Korea from an ethical source. Would I buy this product? Yes. I feel the price ($19.95) is reasonable, and I really trust Life Without Plastic! After reading about the company, I know I can buy anything on their site without compromising our health and environmental principles. But is the source ethical? If from China, it is questionable. I think this looks like a really good product. Luckily, my mom saved my own stainless steel forks and spoons from when I was a baby. I was able to use them for my own son. This was pretty cool! All the BPA and Phalates in childrens’ toys these days is ridiculous, but it is even more absurd when it comes to these toxins being in utensils. I am glad companies like Life Without plastic are doing what they do! Cute for the very little ones but not useful for 4-yr olds or above, who are learning how to cut their own food, but have too small hands for adult flatware. It would be nice if the company made a functional variety with serrated knives for the 4+ age group. Sadly there is pretty much nothing like that on US market, only in the UK. I guess European parents are less overprotective and more willing to give their kids age appropriate learning opportunities. The IKEA set has a serrated knife, for what it’s worth. Steel is the product of stainless iron which is flexible but hard and strong so it is used in many aspect of the life of the human such as in housing, motering kitchen appliances etc.